Hello friends! Before I start this post telling you about my trip to Italy, I’d like to begin with some random facts so that you can be informed about my current life status as well. First, this morning on the way to class, I had what I think is my favorite pastry I’ve tried since I’ve gotten to Europe. This is a monumental event… I’ve spent money on some real dud pastries, but this one was DELICIOUS! Strawberry and rhubarb in the lightest, most flaky pastry ever. Yum. Second, yesterday I went to the bookstore and bought “Everything is Illuminated.” I know I’m like 8 years late, and I’m only one chapter in, but OH EM GEE is it good! Third, I am currently listening to Train’s latest album. Again, I know I am quite behind with this one, but I am convinced that they really can do no wrong. Love it. OK, now on to bigger, older, and more important things. Like my trip to Italy! When I planned my Rome trip a few months ago, I was just planning on going alone (which, in hindsight, would have been awful), so the dates of my trip didn’t match up with the dates of my travel buddies’. So instead of staying in Rome the first night, I took the train to Perugia, about 3 hours north of Rome, to stay with Melissa. Perugia is a little city on a hill in the region of Umbria, about 30 minutes from Assisi. The views are incredible because, you know, it’s on a hill, and this region of Italy is especially breathtaking… cute houses built into the hillsides, rolling landscapes, blue skies… gorgeous. Melissa took me on a little tour around the city to the different viewpoints, and also pointed out two of the churches in Perugia, both of which are on the list of “ugliest churches in Italy.” The Dom looked like a barn. Too funny. Since it was Melissa’s and her roommates’ last night in Perugia, they had planned on going to a restaurant that none of them had ever been to, but which is apparently quite renowned within the city. Its name is literally “the room of lost time,” and it consists of probably 5 tables and one old Italian woman who hand-makes all of the food. A meal there takes about 2 hours, if you’re lucky and it’s not crowded. Fortunately, we were the only people there when we first arrived, so our meal wasn’t extremely time-consuming; rather, it was relaxed and leisurely and so fun. We shared wine and ate bruschetta and delicious pasta and I listened to the girls reminisce about their semester. It was really interesting to catch them at the very end of their study abroad experience, when I’m just beginning mine. Continuing with the “last night in Perugia” theme, everyone planned on going out to the street of bars in the city center later that night. That was quite an experience… it was basically a whole bunch of American students cramming into a tiny little bar buying drinks and then heading out into the street (because of the lack of open container law! Again… weird!). This was apparently one of the tamer nights in Perugia, because everyone was saying good-bye to each other and “wanted to actually remember it.” Haha. The best thing about Perugia nightlife, I have to say, is the amazing marketing strategy of one of the local bakeries. This place starts baking pastries at 1:30 AM, so it opens up shop for all the students coming from the bars to buy croissants or donuts for a Euro. Apparently this is somewhat frowned-upon by the authorities, so the American students call them “secret pastries.” I must say, they were delicious and a good way to end the night. A night on the town in Perugia... craaayzay. Also--check out my purple shirt! 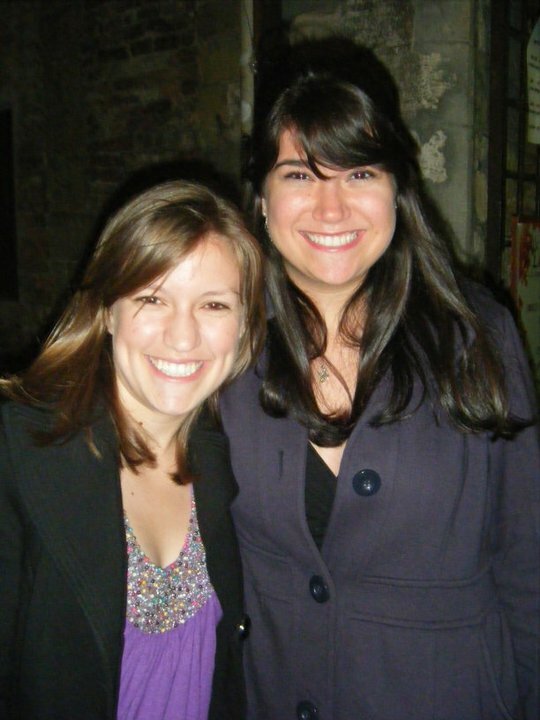 My best friend and I each have one, and we both agreed to wear it that day even though we're on different continents. I know, cute. The Rome Metro was a shock at first, because of how dirty/crowded/big-city it is. We barely fit on the train with our luggage… I think I almost smothered a baby with my ginormous backpack. But once we were out of the Metro, I was able to take in the true beauty of the city. It was an absolutely perfect day. We sat outside and ate some bruschetta, because we had missed lunch due to the aforementioned ticket debacle and it wasn’t late enough for dinner, and enjoyed the amazing weather. We then attempted to walk to the Trevi Fountain, considering that we had gotten off the Metro at the Trevi Fountain stop, but apparently it was “too complicated” for our waiter to give Melissa directions to get there (what?! ), so instead we followed some signs to the Spanish Steps. I wasn’t expecting much from the Steps, because let’s be honest… it’s a staircase. But it really was beautiful! The whole thing was decked out with pink and purple flowers, the sky was sapphire blue, and there were people milling about everywhere… it was charming. 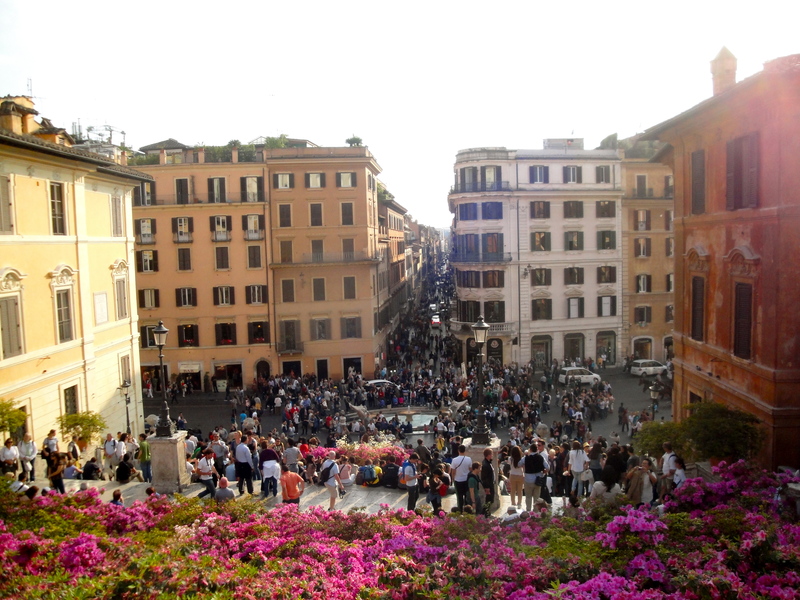 The view FROM the Spanish Steps... I know, I decided to shake it up a bit. Check out those beautiful flowers and the huge crowd! Love it! At that point, we went to meet Monica near the Colosseum so we could check into our apartment and finally get rid of our luggage. It was really something to step out of the Coliseo Metro stop and immediately see the huge Colosseum. Only in Rome, man. We got to see even more crazy ancient Roman sights en route to our apartment, which was really closer to Circus Maximus than it was to the Colosseum. 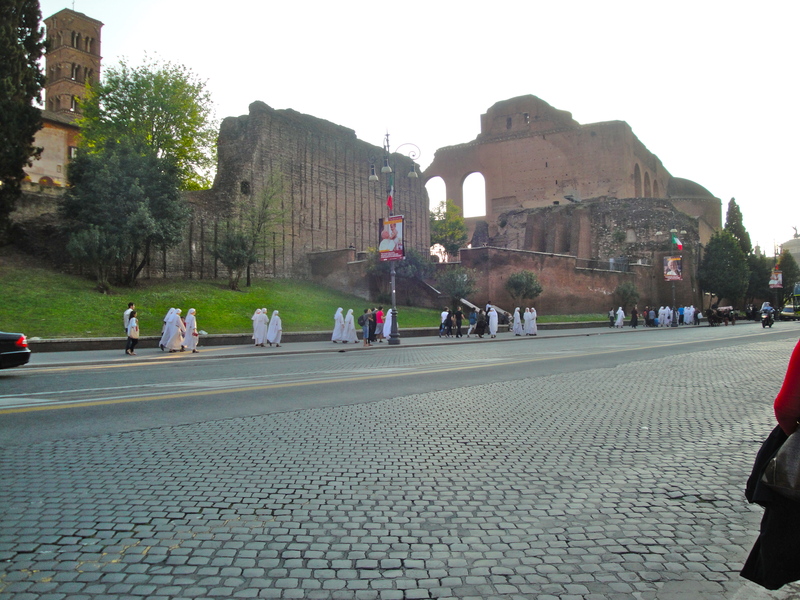 Not only was it surreal to just casually walk past the ruins of Circus Maximus, but we were all reminded of the reason why we were in Rome on this specific weekend when we passed this huge group of nuns, walking almost procession-style. Crazy and AWESOME. It was really cool to see priests and religious all over the place all weekend. One of the best instances was when, after a 10 minute conversation about the Milanese Rite versus the Roman Rite while walking through Rome, we turned around and discovered that a priest had been walking behind us. I wish he had joined in the conversation and/or told us how wrong all of our facts are, but he just wished us a good day and kept on walking. After stopping at the ATM and dumping all our luggage at the apartment, our quest to find delicious pasta began. It didn’t take long, this is Rome, remember? 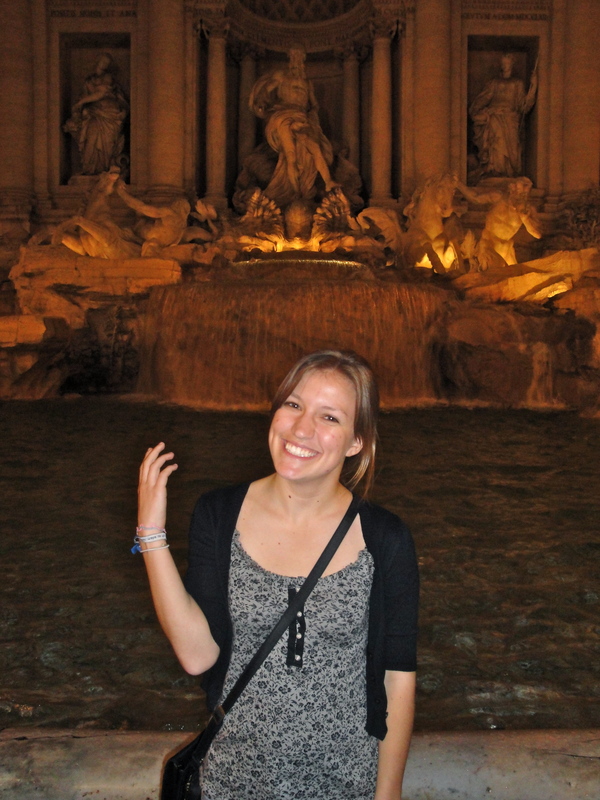 We ate near the Trevi Fountain, and it was delicious. I am kind of thankful that I am not studying in Rome because I would weigh 500 pounds by August if I were. Then we did the obligatory touristy “throw the coin in over your shoulder” thing at the Trevi Fountain and had to fend off some awkward creepsters who wanted to take a picture with us, but then brushed off our rejection by pretending that they really wanted us to take a picture OF them. Yeah, right. In this picture, I'm not actually throwing a coin... I used up the coin for the first picture, which didn't come out very well. And no way was I throwing away another .01 Euros! At first, I was a little bummed that I hadn’t gotten to see any of the ruins in the daylight, but it really was very cool at night. Everything was lit up, and the darkness and lack of crowds made it seem like we had just kind of stumbled upon all these cool old ruins… it didn’t seem like we were the 10,000th people this week to look at them. Which was kind of nice. 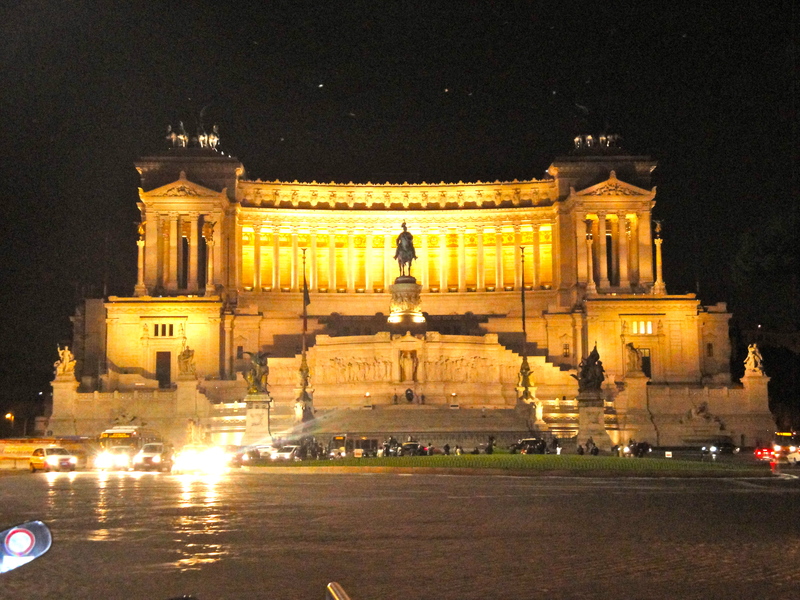 I really did love seeing Rome spontaneously, without the help of a guidebook or anything like that, and with people who really made it fun. Even if my feet did hurt something fierce afterwards. We finished up our serious and scholarly tour of all the sights of this old, important city by doing the only logical thing: attempting to drink out of the fountains. It did not end well. Being that we were all exhausted, we headed back to the apartment and went to bed, knowing that the next day would be JAM PACKED with fun Vatican stuff. It was so jam-packed that I actually have to cut this post off here. I will report back, probably later today, with my account of our Vatican City adventures and the celebration of Pope Blessed John Paul II’s beatification! And just because the title of this post reminds me of this song, and because I enjoy intertextuality and Ben Folds: here! wow, that sounds incredible! what an awesome experience, and so cool that you got to be with friends. i hope the baby you almost smothered turned out okay. You are not weird for liking colors! Colors are wonderful! You’ve read The Giver, right? If not, you should. Color appreciation should be more widespread. omy gosh. the room of lost time sounds awesome! And somehow i just skipped over the baby paragraph.